Ssuk-beomul (or ssuk-beomuri) is a snack that I used to make in the early spring every year. I’ve always thought the name ssukbeomul sounds very nice and delicious. Ssuk means mugwort and beomurida (버무리다) means “mix” or “toss,” so you can probably guess why this recipe is called ssuk-beomul! Yes, mix mugwort and sweet rice flour and steam it. I use sweet rice flour in this recipe, but you could use rice flour, too. Put some ssuk-beomul into your mouth, chew it slowly, feel the flavor and feel the spring! Fresh mugwort (ssuk), sweet rice flour, sugar, salt, and water. Clean 2 cups of mugwort (70 grams) by washing thoroughly and rinsing and draining in cold running water a couple of times. You may need to scrub it by hand to remove any residual dirt from between the leaves. Slightly squeeze the clean mugwort and put it on a microwavable plate. Add ⅓ cup sweet rice flour, 1 tbs sugar, ¼ ts salt, and 2 tbs water. Mix it up with both hands until there’s no sweet rice flour left at the bottom of the plate. Cook it for 3-4 minutes in the microwave oven. Take it off the plate and turn it over with a spoon or spatula. 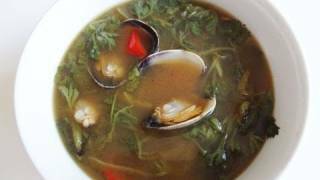 My other mugwort recipe, mugwort soup (ssukguk) is here! Posted on Friday, April 8th, 2011 at 12:20 pm. Last updated on October 5, 2014. Posted March 7th, 2016 at 10:49 am | Log in to reply. Maangchi, is there any vegetable substitute for the mugwort you used here? I had never seen mugwort here in Hong Kong prior to watching your video. I was wondering if there’s any more commonly found vegetable that has a similar taste. Thanks!! Posted April 30th, 2011 at 4:45 pm | Log in to reply. mugwort soup and the rice cake brings me right to my halmonii’s cooking (heart)! I’m so excited to make this; got all the ingredients and ready to make the soup. I want to make the rice cake too but I don’t use a microwave- what would be the alternative method. Thank you Maangchi for making the path to the fondest of my childhood culinary memories; a hop and a skip away! Posted April 30th, 2011 at 9:20 pm | Log in to reply. halmoni (grandmother) must be a great cook for everybody. My halmony made ssukddeok (mugwort rice cake), too. You can steam it. ” my childhood culinary memories;” that’s true! Cheers! Posted April 19th, 2011 at 11:46 am | Log in to reply. Posted April 14th, 2011 at 9:16 pm | Log in to reply. must make that ssuk ball thing! i love the taste of ssuk and the chewy texture of rice cakes. only thing, how do you make it without a microwave? thanks! Posted April 15th, 2011 at 9:42 am | Log in to reply. 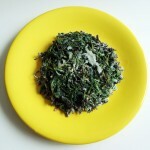 This recipe was originally posted on April 8, 2011 at 12:20 pm by Maangchi. It was last updated on October 5, 2014. The video was watched 139,293 times on YouTube & has 1,013 likes!